After considering François Couperin’s Pièces de Clavecin, investigating Rameau’s keyboard works is an inevitable next step. 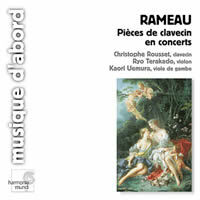 Jean-Philippe Rameau (1683-1764) published his solo keyboard works in three major collections: 1706, 1724 and 1728/29/30. The composer, rumored to have been gaunt and short-tempered, earned greater attention for his 1722 Treatise on Harmony than his music or organ playing had by then achieved. In 1733, shortly before his 50th birthday, his first opera, Hippolyte et Aricie, caused an instant furor comparable to that of the Rite of Spring’s 1913 premiere. 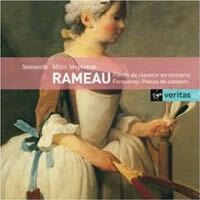 Rameau became the most celebrated, if not notorious, composer in pre-Revolutionary France. One either stuck to the past by perpetuating Lully’s traditions or embraced the new: Rameau’s daring harmonies and unexpected forms. André Campra said of Hippolyte et Aricie that it afforded enough invention to make ten other operas. As with Couperin, Rameau’s Pièces de Clavecin have been recorded on both harpsichord and piano, though it’s hard to imagine Le Poule clucking on anything other than quill-struck strings. 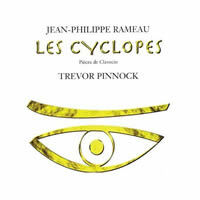 Among recent Ramellian piano releases (admittedly, I’ve sampled a small set), few attempt the most extroverted pieces, such as Les Cyclopes. With wide left-hand tenths (take the standard D – F – A – F Alberti bass, but lower the D an octave), this colorful rondeau is risky on a modern piano’s wider keys. On the harpsichord it’s a breakneck ride that plunges towards the instrument’s extremes. Rameau’s keyboard oeuvre straddles two traditions: the previous generation’s dance suites and the pièce as nascent tone poem. Suites typically contain named pieces alongside allemandes, courantes and sarabandes. The 1706 collection’s initial Prélude connects Rameau to the past with its unmeasured opening. The virtuosic passages within Les Cyclopes, Les Niais de Sologne, Les Trois Mains, and the final doubles of the A-minor suite’s Gavotte, along with the various hand-crossings and blocked chords revel in the harpsichord’s aggressive potential which would culminate years later in Pancrace Royer’s ambitious Pièces de Clavecin (publ. 1746). I’ve come to realize that Rameau’s keyboard music satisfies better on its intended instrument (resounding “Duh!” from many quarters). Pianists tend to play with a louder right hand, also an overused sustain pedal smudging Rameau’s pure lines, ornaments, and precisely voiced chords, the logic of which doesn’t transfer well to the piano’s timbres. This is especially evident in the Gavotte and its six Doubles (variations) which require left and right hands to alternate fast passages and chords. On harpsichord, neither hand overwhelms the other, whereas the piano’s innately uneven balance dislocates the set’s momentum. The budget sheet-music edition is the Dover reprint of Durand’s 1895 Saint-Saëns edition (ISBN 0-486-27847-6), with a few spurious pieces added. 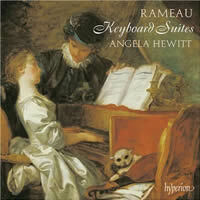 Rameau’s complete published keyboard works fit comfortably on two discs. On harpsichord, Christophe Rousset’s complete set (L’Oiseau-Lyre 425 886-2) stands above all others. Recorded in 1989, the music emerges as brilliantly gripping and virtuosic. The recording captures the music stand’s perspective, and the hands are well balanced. The primary instrument is a 1751 Henri Hemsch owned by the Moulinié family, with a 1988 Sidey employed for the 1706 Premier Livre. 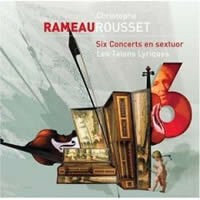 Rousset clearly has the orchestra in mind (he founded his band Les Talens Lyriques in 1991). Rameau worked several of these pieces into his stage works: for example, a Tambourin appears in Les fêtes d’Hébé, Dardanus recycles Les Niais de Sologne, Les Sauvages closes Les Indes galantes, etc. 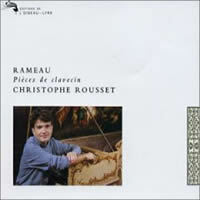 Rousset’s O/P recording appears to be available through ArkivMusic’s on-demand reissuing service, ArkivCD. I haven’t had the chance to compare the ArkivCD pressing with the original and can’t vouch for its fidelity. 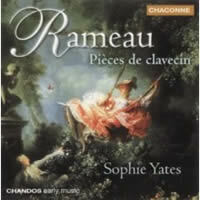 Among readily obtainable complete Rameau sets are two separately released discs featuring Sophie Yates (Chandos CHAN 0659 from 2000 and CHAN 0708 from 2004). Yates plays delightfully, in a slightly more mannered fashion than Rousset. Her warm sound within a generous ambience is most satisfying. Selecting suites and pieces from 1724 and 1728, Trevor Pinnock has recently returned to Rameau’s solo keyboard works with a single Avie disc (AV 2056): the complete E-minor suite, three selections from the D-minor suite, the entire A-minor suite, and three works from the Suite in G. The lower notes of his 1764 Jean Goermans harpsichord (mod. 1783/84 by Pascal Taskin) are robustly percussive. It’s a steely instrument, perhaps too harsh for many — perfect for Ligeti and Xenakis. The opening Les Cyclopes is extraordinarily rambunctious. La Poule has sharp claws and clucks shrilly. It’s a persuasive extroverted exploration. I wish Pinnock had incorporated more surprises, such as the added damper to Fanfarinette, serving as a delicate oasis between Les Trois Mains and La Triomphante. Breaking with tradition, Pinnock sensibly reprises the Gavotte at the Doubles’ conclusion. As in my Couperin remarks, a comparison between Alexandre Tharaud (Harmonia Mundi HMC 901754) and Angela Hewitt (Hyperion CDA67597) has become inevitable. Their Rameau interpretations differ more than their Couperin. Hewitt’s 2007 release (suites in E minor, G minor and A minor, recorded 12/2006) is neat and straight-ahead, whereas Tharaud’s 2001 recording (suites in A minor and G minor plus Debussy’s Hommage à Rameau from the 1904/05 Images) reveals a hot-blooded poet. Purists will prefer Hewitt; listeners who want to be swayed by a personality will flock to Tharaud. Right from the start, Tharaud employs notes inégales in the Allemande from the Suite in A (Rousset did too). He appears to treasure this music, contradictorily expressing both impishness and awe. Close listening with score in hand suggests a few liberties with octave displacement. If Hewitt makes similar adjustments they’re especially demure. 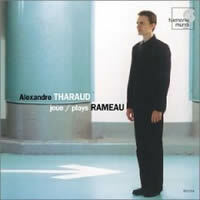 Les Trois Mains seems just a title to Hewitt, whereas Tharaud creates the illusion effortlessly. As a surprise, Tharaud’s Suite in G is fairly sedate and less convincing than the A-minor suite. He downplays L’Enharmonique’s harmonic twist, though it’s easy to envision Louisiana Indians dancing in silk slippers for Les Sauvages. I’m not convinced by his rhythmic liberties in La Poule. In the concluding position — indeed, as if from another planet — Tharaud’s Debussy encore shocks. Hewitt arranges the three suites so that the grand Gavotte and six Doubles conclude her program, a good dramatic move. 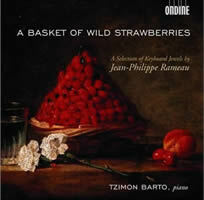 She begins with the E-minor pieces from 1724 which include the popular Le Rappel des Oiseaux, Tambourin and Rigaudons. Hewitt’s Bach and Couperin have left me cool, but her prim demeanor works for Rameau. Hyperion’s dry acoustic reduces pedal resonance, emphasizing a lean touch. I wish the left-hand / right-hand balance were more equal, but Hewitt gets the spirit of these pieces, and her disc grows on me with each listen. Tzimon Barto (Ondine ODE 1067-2) admits he’s anachronistic (var. selections from the 1706 Premier Livre and the suites in E minor, D minor and A minor). Inspired by Minkowski’s 2001 production of Platée and Christie’s Les Boréades in 2003, Barto adopts an operatic conceit for his Rameau. Both conductors ought to be upset by the association. Tempos can be astonishingly slow and liquid (the 1706 Prélude is stretched to 4:15 compared to Rousset’s idiomatic 2:32; the A-minor Allemande is 8:13 compared to Hewitt’s 5:04 and Tharaud’s 6:00; La Villageoise is 3:29 while Hewitt is 2:43). He suppresses ornamentation when he thinks it interferes with the line and has his way with repeats. The polyglot instrumentalist (he reads Homeric Greek, Classical Latin and Biblical Hebrew, and studies Farsi and Mandarin) is proud of “having 36 dynamic colors between ppp and fff” which makes some melodies throb nauseatingly. Leaden pedaling simulates droning bagpipes in the E-minor Suite’s Musette en rondeau. Barto flings overly accented, piercing-dart notes in Les Niais de Sologne. If this be Romanticism, it’s not for me. 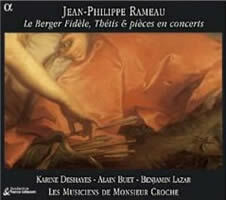 But Rameau can shoulder the blows, so if it’s iconoclasm you’re looking for, Barto’s freak show may be just the thing. I’m stretching the Pièces de Clavecin theme to include Rameau’s only chamber music, the divine Pièces de Clavecin en concerts (1741). Despite customary performance in trio formations, they bear little resemblance to contemporaneous, Italian-influenced trio sonatas; each part is fully notated and equally proactive. Rameau’s prefatory remarks explain his intentions, but they also open the door to varied interpretation. These are principally harpsichord pieces even though the score includes other parts which can be omitted (corresponding cuts are indicated in the keyboard part). The accompanying violin (or flute) and viol (or second violin) parts are especially intricate and, to my ear, necessary. The Pièces de Clavecin en concerts come from the start of Rameau’s opera career and are gorgeous, dramatic works performances of which require taste and balance. A Rachel Podger fan, I eagerly anticipated her Rameau with Pinnock and gambist Jonathan Manson (Channel Classics 19098 CD). Sad to say, their potentially incomparable trio lacks joie de vivre. Their Rameau is a somber affair. In contrast to other nicely recorded Channel items I’ve heard (Podger’s Mozart sonata series, Ivan Fischer with the Budapest Festival Orchestra, etc. ), the sound is pedestrian. A 1992 Harmonia Mundi release, HMC 901418, captures Rousset with Ryo Terakado, violin, and Kaori Uemura, viol. The solo-harpsichord versions are inexplicably interwoven with their full trio originals. In the Première Concert, a solo La Livri intercepts La Coulicam and the original trio La Livri, untethering the horses from the carriage. 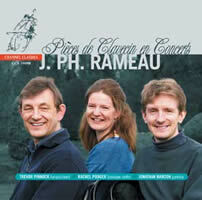 Perhaps it’s excessive familiarity with the trio version, but Rameau’s harpsichord-only renditions lack drama. The other solo harpsichord versions are placed after their multi-person originals. The Quatrième’s L’indiscrète appears after the Cinquième concert, which alters that concert’s closing mood, the poised La Marais. My favorite recording among handily obtainable Pièces de Clavecin en concerts releases belongs to Sonnerie: Monica Huggett, violin, Sarah Cunningham, viola da gamba, and Mitzi Meyerson, harpsichord (Virgin VC 7 59154 2, or reissued alongside a disc of Forqueray’s harpsichord suites on Virgin 7243 5 61872 2 1). Recorded in 1986, the trio takes a different order: 4, 2, 1, 5 and 3. The balance is fine, the ensemble is spirited, and their liberties (sul ponticello effects in the Quatrième’s L’indiscrète) are well-considered. Among troupes which alternate winds for the leading violin, Les Musiciens de Monsieur Croche (Alpha 067) offers three Concerts with two earlier cantatas, Le Berger Fidèle (1729) and Thétis (1719?). Flute joins violin to take the Première and Cinquième Concerts’ top parts. The Troisième keeps to strings. The frail flute encourages lightness, exposing the lines, and the tempos flow gently. The Troisième Concert’s closing Tambourins exhibit rustic touches and thoughtful, Italianate ornamentation. Ensemble weight appears in the cantata Thétis which, like Le Berger Fidèle, contains wonderfully colored singing and phrasing. The disc opens with a lengthy spirited narration (in French) from 1740, Defense of the Bass Viol against the Encroachments of the Violin and the Pretensions of the Violoncello by Mr. Hubert Le Blanc, docteur en droit. Finally, we have the spurious orchestrations of the Pièces de Clavecin en concerts, attributed to Jacques-Joseph-Marie Decroix (1746-1826), a lawyer who circulated through the French court and an early Rameau fan and collector. The Six Concerts en sextuor rearrange Rameau’s five trios for larger ensemble and add a sixth with orchestrations of other keyboard works, including La Poule. (Respighi went further orchestrating La Poule for Gli Uccelli in an aberrant España style.) For the Six Concerts, my favorite has Rousset leading Les Talens Lyriques (Decca B0001845-02) with its pungent doubled voices and perfectly tart bassoon. The slightly frosty Decca sound masks the occasionally friskiness. Many pieces, such as the Troisième’s La Poplinière and the Quatrième’s Le Pantomime, make so much sense writ large with strings and continuo. Those interested in Pièces de Clavecin en concerts visuals ought to investigate the extra content on In Convertendo (Opus Arte OA 0956 D) where members of Les Arts Florissants play La Timide, La Poplinière and La Rameau. These are competent performances — a flute has been added to La Timide, with the customary trio for the remaining two — that play out as demonstrations lacking significant context. The DVD leads with Christie conducting the motet In Convertendo with its amazing closing fugue, Euntes ibant et flebant. There’s also a 58-minute documentary on Rameau, The Real Rameau, including biographical and analytical bits from Christie and Rameau scholar Sylvie Bouissou, musical snippets of operas, keyboard works (Christie performing), Pièces de Clavecin en concerts, and dramatized excerpts from Diderot’s Rameau’s Nephew.